Thursday is set to become one of the hottest nights on the Ibiza club calendar this year, with the introduction of Richie Hawtin’s visionary ENTER. concept. Hawtin will take over Thursday nights at the award-winning club Space, curating five areas built on the principles of music, sake, technology and experience. The main experience will take place in Space’s main room, which will be specially customized with new structural lighting installations and technologies. 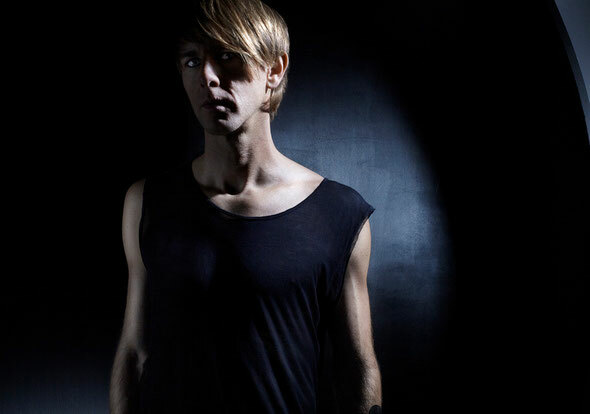 Joining Hawtin over the season are key members of his extended M-nus family; Magda, Paco Osuna, Gaiser, Heartthrob, Ambivalent, Hobo and Matador. 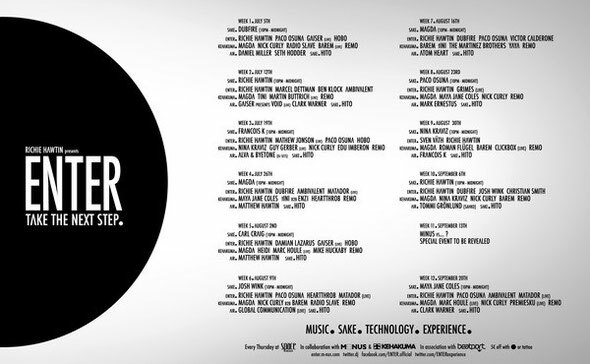 These artists will create the foundation of the event, uniting each week with other friends and collaborators including pioneers such as Dubfire, Carl Craig, Christian Smith, Josh Wink, Berghain residents Ben Klock and Marcel Dettmann, Mathew Jonson and NYC’s finest Victor Calderone. On August 2nd, after talking about it for years since an after-hours at Bar 25 in Berlin, Hawtin and Damian Lazarus finally share the same bill in the main room of ENTER. The two label heads bring their own unique visions and sounds together in a one-night journey into the unknown! On August 23rd, in the spirit of bringing new talent to the island, Hawtin invites up-and-coming fellow Canadian Grimes (aka Claire Boucher) to an exclusive Ibiza appearance in ENTER.’s main room. Citing influences as wide-ranging as Aphex Twin, TLC, New Age, Industrial and Glitch, Claire’s futuristic sound encapsulates the musical vision of ENTER. This night will feature a special extended set by Hawtin playing both before and after Grimes. Continuing on with the tradition of his long time relationship with Cocoon and Ibiza, Hawtin & Sven Väth will come together in a special double header during late August seeing them share Amnesia’s Terrace at Cocoon on Monday August 27th and then later again that week on Thursday at Space in ENTER.’s main room (August 30th). A special and rare appearance on Ibiza for Väth outside of his Cocoon Amnesia residency and a rare moment where Väth & Hawtin, long-time friends and collaborators, once again unite to celebrate the music they love in two nights of intensity and craziness.